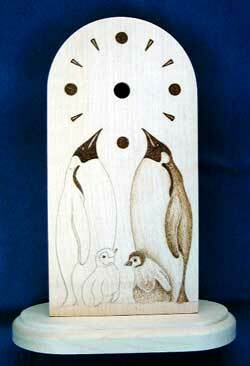 The design on this solid sycamore mantle clock (approx 8.75" tall) is a variation on the theme of the original King Penguin clock depicted in the Portfolio: Clocks gallery. 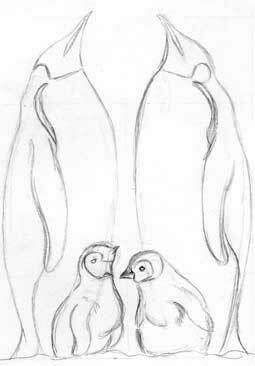 An actual size pencil sketch of the penguin design was first prepared on paper. This was then incorporated into the pencilled layout on the clock itself so that the beaks of the two adult penguins form the 5 and 7 o'clock position of the dial. 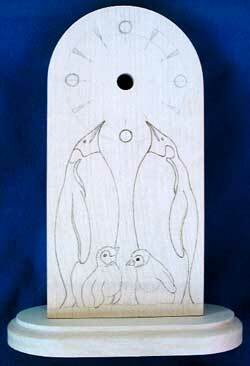 Using the pencil lines as a guide, the outline of the penguins was first burned in with the pyrography pen. A combination of circles and complementary beak shapes form the dial of the clock. 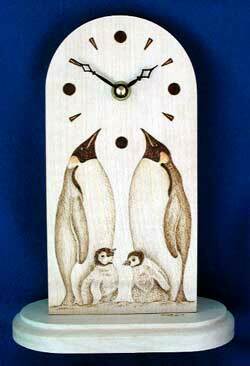 These were burned first with the pyrography pen prior to commencing work on the right hand penguin and chick. Once pyrographic shading of the design was complete, a touch of artist quality coloured pencil was added to the beak and neck areas to enhance realism. The finished clock was then given three coats of a non-yellowing satin varnish to seal and protect and fitted with a quality quartz movement and hands.